The crunchers are basically either a C shape or a crabs claw where the claws compress together to crush the material. It is powered by hydraulics and is driven by either an electric or diesel/petrol engine. The C shaped type has a piston that closes to crush the material. The limitations of this method are that the jaws are heavy and require a counter balancer to take much of the weight. It is also restricted to material under 350mm in thickness. It requires a fully boarded scaffolding below the floor area being worked upon. 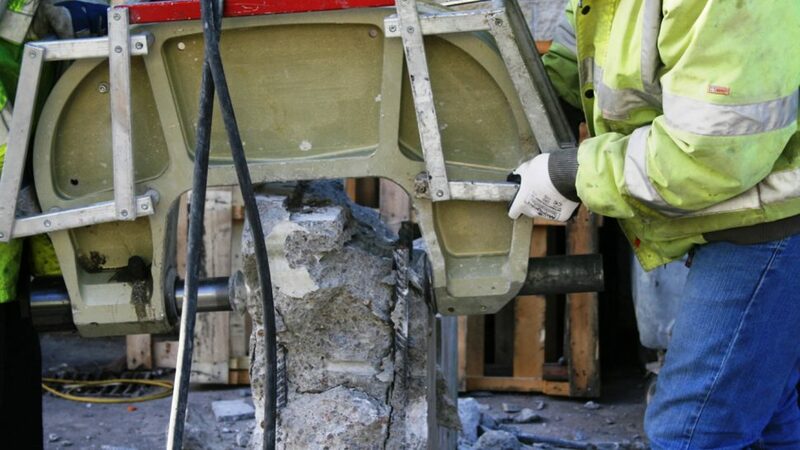 The advantages are small resulting rubble, no vibration, almost no noise and no water.